Online business has become a byword since last one decade. Since the rapid growth of the digital world, then inevitably have dragged business people to jump online marketing model to pursue this by creating a business website. Interestingly, many of my friends said that their business websites do not work and they did not gain anything from that website. The point of this problem is simple, actually lies in the design of the website, whether his performance both in terms of content and looks quite presentable to visitors so as to encourage them to do something like that you want. #1) Does the website you have zoom memorable professional? Appearance website are the channels that indirectly provide imagery to yourself, whether you are a professional or not the typical person. # 2) Is your business website provides content for what? For example, if your business website offers coffee powder products in addition said that what benefits the coffee products, offer additional information about the recipes make great coffee. # 3) Is your business website makes it easy for people to contact you? It would be foolish if you as a business to not make a standalone page that lists the phone number or email address. It is the same with suicide. So make sure your business website has complete contact information, including home address. # 4) Is your business website to provide online payment options for customers adequately? Sometimes the failure of the occurrence of an online transaction is triggered by trivial issues about the mode of payment. Can you imagine how difficult it perform payment transactions with having to commute to the bank while at the same time there are other things that must be resolved as well. # 5) Is your business website is safe enough to perform payment transactions online? Transact online, the estuary was closed by the action of a cash payment. But there is a doubt, is quite safe making online payments, lest we compromised accounts. For that I share tips characterize business website that has been equipped with security facilities. One hallmark of a safe business website is equipped with an SSL certificate. The signs, they have the display as follows: https://url.com/. The letter "s" lowercase at https means secure or safe. Another distinctive feature is the padlock sign on the left side of the website address displayed. # 6) Do you do the website optimization for search engines? Now you have a business website showcasing your products or services you offer. So have you show the way to potential consumers who leads your business website? 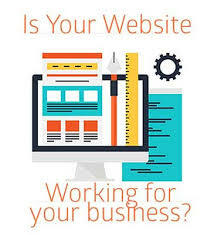 A very good question, part of which we are speaking, the important point how easily search engines find your business website. Is there a website be on page 1 of search engines? Key answer is the key word (keyword), make the title of the article by using the right keywords, in the search for a lot of people but has a low level of competition. Do not forget to also pay attention to the density of those keywords in articles that you write. About how to find the right keywords, you can read the previous article that I cover in depth. # 7) Is the business website has been integrated into social media? The presence of various social media sites today have further strengthened the recognition of the existence of your business. Proportion can be seen from many sedkitnya number of tweets or like the love of your business website. It will indirectly affect the business website rank in the eyes of search engines. The higher the rank of a website both globally and regionally Indonesia the opportunity to occupy the first page of search engines. That means your business website ready to be overwhelmed by visitors like flash floods. The purpose of a business website made undeniable is to provide potential customers for your business. For that you are actually able to answer seven questions as told earlier satisfactorily.